Lapageria is a half hardy perennial vine. It flowers from the middle of summer to the autumn and carries dark pink trumpet shaped flowers. The foliage of Lapageria is sharply pointed and of a leathery nature. 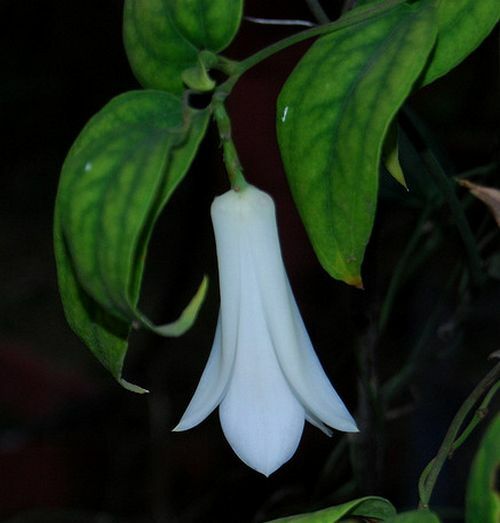 Some common names for the one member of the Lapageria genus include Chilean bell flower and Copihue. Copihue (Lapageria rosea)by Paul Lowry. Chilean Bellflower by Paul Lowry. 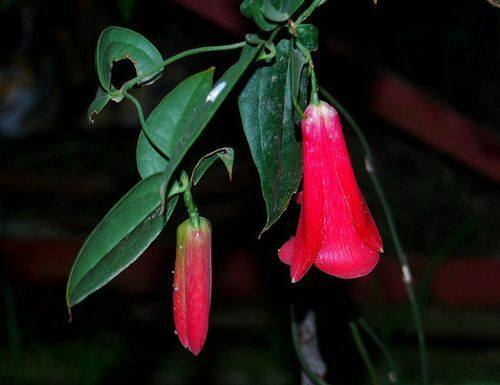 Common Names: Copihue, Chilean Bell Flower. Height: up to 390 inches (1000 cm); Vine. Flowers: From the middle of summer through to autumn. Flower Details: Red, Pink. Spotted with white. Trumpets about 3.5 inches (9 cm) in length. Foliage: Evergreen. Leathery. Pointed. Ovate. Wiry stems. Shrubby vine. Sow Inside: 1/8 inch (3 mm). Germination one to three months. Temperature: 65 to 75°F (18 to 24°C). Beginning of autumn using fresh seed. After two years of growth, transplant the seedlings to their final location following the last frost. Spacing: these vines should be planted by themselves. Requirements and care: Full or afternoon shade. Good drainage. Humus rich soil. Acidic soil. Regular watering during dry periods. Winter straw mulch. Spring feed with low nitrogen organic feed. Propagate: by taking cuttings in the spring or autumn. Miscellaneous: Pollinated by hummingbirds. 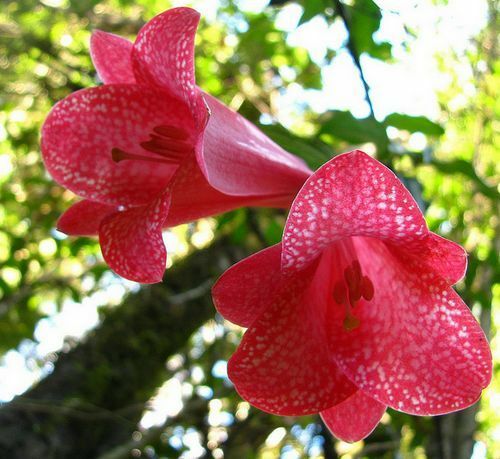 Lapageria rosea (Copihue), is the national flower, and a protected species in its native Chile. The plant is often mentioned in Mapuche stories. It is best to start off Copihue / Chilean bell flowers and other Lapageria plants indoors; only grow them if you live in a warm climate. The Chilean bell flower should be sown in the autumn from fresh seeds; sow at a depth of 3 mm into a humus rich soil. It can take anything from one to three months for the Lapageria to germinate at a temperature of 18 to 24 degrees centigrade. Once germinated the Lapageria plants should be grown indoors for two years then transplanted into the garden following the last possible frost of spring. They should be grown individually in a shady part of the garden (though the climate should be warm). If you require more plants then cuttings can be taken in either spring or autumn.